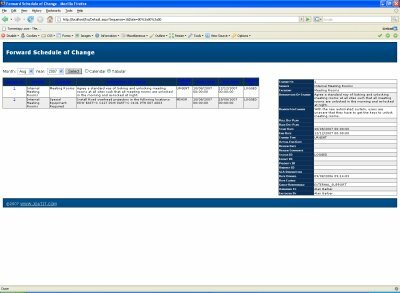 Reporting Magic is an enhanced Management Information System for use with the BMC Magic Service Desk Suite / Service Desk Express. Based on Microsoft SQL Reporting Services, Reporting Magic offers a genuine alternative to the Crystal Reports package that is bundled with the Magic Service Desk Suite / Service Desk Express. 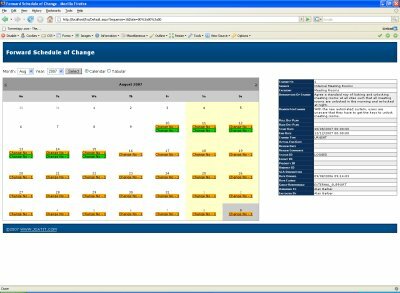 Reporting Magic will provide, out-of-the-box, a replacement for every one of the standard 121 reports with Magic Service Desk Suite 8.0. Microsoft SQL Reporting Services allows a report to be built from any number of data sources. This includes non Microsoft based data sources e.g. 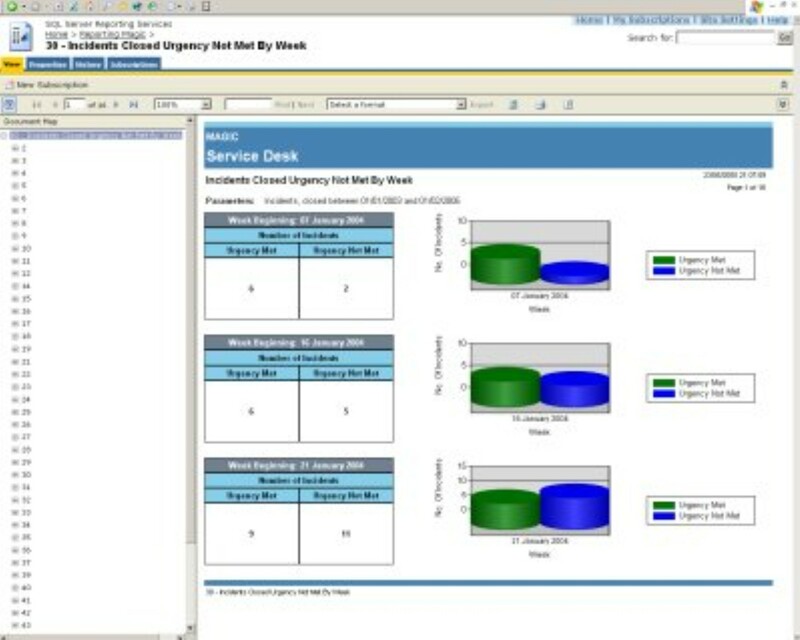 Peoplesoft on Oracle. Microsoft SQL Reporting Services allows security to be set at a folder or even individual report level. Users who don’t have access to these reports don’t even see them! Microsoft SQL Reporting Services allows subscriptions to be created and reports sent to users via email. Microsoft SQL Reporting Services provides a completely web based (zero-client installation) reporting solution thats only licensing requirement is that you have a licensed copy of Microsoft SQL Server 2000. Microsoft SQL Reporting Services allows the use of either T-SQL or Stored Procedures – it is your choice. Microsoft SQL Reporting Services uses Data Source files to tell the report which server/database to call. These can be specific to the report or shared across any number of reports. Using this Data Source technology your Management Information System can be immediately re-pointed at a new server/database in the event of disaster – all via a web interface. Microsoft SQL Reporting Services allows deployment either via Microsoft Visual Studio or via a simple web interface. Microsoft SQL Reporting Services allows any testing area to be hidden and then reports moved, either on mass or individually, from one area to another – all via a web interface. 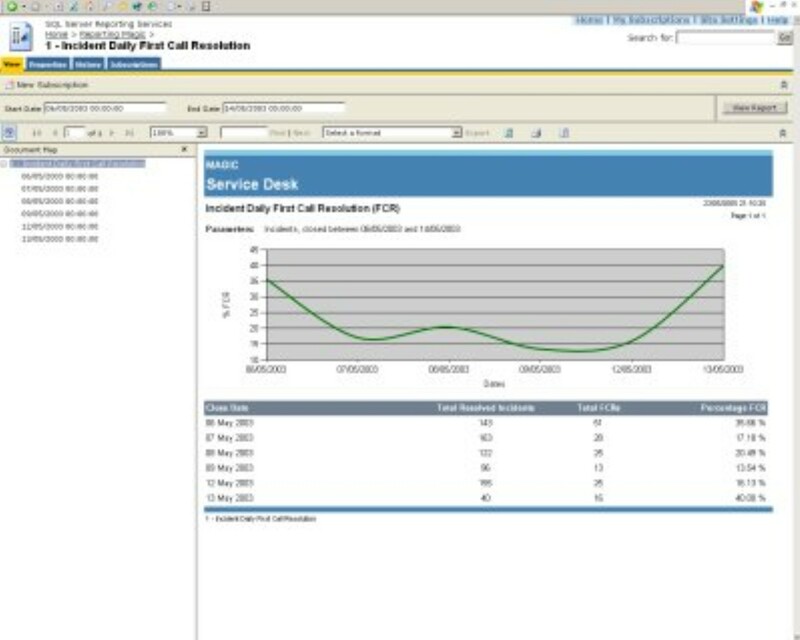 Whilst the reports replace the Magic Service Desk Suite 8.0 Crystal Reports, they will work with both Magic Service Desk Suite 8.0 and Service Desk Express 9.0 and above. You need to download the correct version of the reports for the version of Microsoft SQL Reporting Services you are running. The version of your database server is not important. Unzip the files to any location on your workstation. Upload them to your SQL Reporting Services installation. Reporting Magic needs to have read only access to the SDE database. You may either use an existing SQL server account or create a new one for the reports (recommended) – ONLY requires dbreader (read) access. The only Copyright on these reports is that you don’t charge for them. These reports are provided free of charge and you are free to make as many changes as you like. All I ask is that you don’t take any credit for what you haven’t done! It is as simple as that.